What do you think people did before they had an abundance of commercial cleaning products to choose from? Spring is here and that means it’s time for a good spring-cleaning. Instead of bringing in chemical cleaners to do the dirty work, opt for a deep, green clean. Using safer cleaning products helps create a healthier home and a healthier family. 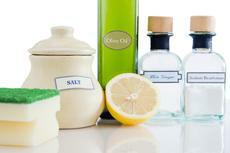 There’s no need to spend a ton of money on potentially toxic chemical cleaners. Instead, use a few ingredients to whip up some healthier homemade cleaners that will work wonders on every inch of your home. The chemical-based products you can find on the shelves of big stores add up. They are doing more harm than good in the long run –health concerns and environmental pollution due to their production and disposal are the biggest concern.